A recent study found recognizable images of human faces in high-res photographs of eyes, reminding us that surveillance technology improves more and more each day. But designers and technologists are working on ways to keep our faces private from prying cameras by combining the weakness of facial recognition technology with fashion. Top image from Stealth Wear. Traditionally, when we talk about facial recognition technology, we are talking about a computer identifying a face in a photograph or video, and identifying certain biometrics of the face, such as the spacing between the eyes, the relative position of cheekbones, the shape of the jaw, and more. The human face has 80 nodes that can be used in facial recognition, but it only takes between 14 and 22 nodes to identify a unique human face. This is a far from perfect system, however. As much as we hear stories about high-end stores using facial recognition technology to spot celebrity patrons and Google banning facial recognition on Google Glass, there are plenty of weaknesses in this type of facial recognition technology. The technology is excellent at recognizing faces dead-on and from certain angles, but it has a much harder time accurately identifying a face's biometric information when looking at a face in profile or near-profile. In an interview with the BBC last year, Alex Kilpatrick, a facial recognition researcher at Texas-based Tactical Information Systems said that the simplest way to thwart current facial recognition systems is to look at your feet; it's subtle and prevents cameras mounted at eye-level or higher from getting a good look at your face. However, biometric researchers are constantly looking for ways to improve upon these systems. One system that may be on the horizon involves making a three-dimensional map of the human face—although if you're on the lam, these systems can apparently be fooled by changes to the physical map of your skin, such as rhinoplasty. Another system currently being investigated involves using a skin print, recording and comparing unique patterns of a patch of skin—something that distinguishes even identical twins. Can't you just wear a pair of sunglasses? If you want to wear a mask that completely covers your face, you can certainly avoid being recognized, but what if you opt for the much less flashy combo of a pair of sunglasses and a scarf wrapped around your mouth? A pair of recent papers out of Institut Eurécom discussed improvements in facial recognition in cases where the face is occluded by clothing or accessories. Object recognition systems can, in fact, recognize the presence of a pair of sunglasses or a scarf, then remove the occluded portions of the face from the program's analysis of the face. For example, if you are wearing sunglasses, the system will recognize the sunglasses and then ignore that part of your face. The program will then simply analyze whatever is left behind. Shengcai Liao, an assistant professor at the Center for Biometrics and Security Research in Beijing, China, told the BBC that it's possible to recognize faces with 30% and in some cases 50% occlusion. Increasingly, simply covering your face isn't enough. So what can you wear in order to avoid recognition? A few years ago, a series of unusual hair and makeup looks created by Adam Harvey swept across the Internet with the promise that they would serve as camouflage against facial recognition technology. So how does it work? Harvey designed the looks based on OpenCV's system (which is why he calls his project CV Dazzle), and it is also meant to thwart the recognition systems eblearn and VeriLook. CV Dazzle isn't just meant to hide your particular biometric information; it's meant to keep facial recognition systems from detecting your face at all. One of the weaknesses of the Eigenface system that computer scientists note again and again is that they are standard faces: symmetrical with two eyes, a nose, and a mouth. The CV Dazzle looks defy the expectations of a standard face by encouraging asymmetry and obscuring key features. Asymmetrical haircuts can obscure one eye and radically change the way your face is framed. Makeup that doesn't enhance your features but instead places against the usual tones and symmetry of your features can make it difficult for a facial recognition system to identify cheekbones or a forehead. Facial recognition systems are looking for a face. CV Dazzle is meant to give you an "anti-face." Last year, Isao Echizen, an associate professor at Tokyo's National Institute of Informatics, and Professor Seiichi Gohshi of Kogakuin University showed off their own anti-facial recognition accessory: a privacy visor that uses near-infrared LEDs to hide the wearer's face from cameras. The idea is simple: the near-infrared light is invisible to the human eye, but visible to cameras, obscuring the wearer's facial features by adding noise to the camera images when the LEDs are lit without obscuring the wearer's vision. Although the prototype privacy visor isn't exactly the most attractive solution, it does have the advantage of not occluding the wearer's face in face-to-face interactions. The privacy visor is for someone who wants to look folks square in both eyes but doesn't want their every movement recorded on camera. Image from National Institute of Informatics. In a rather cheeky attempt to screw with facial recognition technology—namely Facebook's—designer Simone C. Niquille came up with "REALFACE Glamoflage" t-shirts. These weird looking t-shirts have famous people's faces on them, so when FaceBook tries to autotag your photographs, it appears that you're hanging with a crew of Britney Spearses or Barack Obamas. In an interview with Wired, Niquille explained that the shirts were inspired by "ugly shirt" that hides the wearer's identity from William Gibson's novel Zero History. It could also serve as a way to achieve privacy through ubiquity; if you managed to get a ton of people to wear Glamoflage shirts with your face on it, you would seem to be in a lot of places that you're not, at least when employing a facial recognition system like Facebook's. Shirt image from REALFACE Glamoflage. 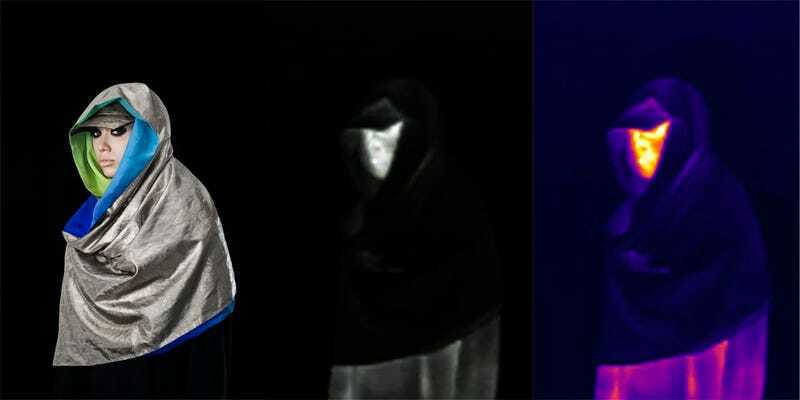 Adam Harvey followed up his CV Dazzle project with a fashion line aimed at hiding wearers from a different sort of facial recognition system, one based on thermal images of the face. His Stealth Wear line uses lightweight metallic fabrics to reflect the wearer's body heat, masking their thermal signature from drones. And unlike CV Dazzle, many of the pieces in Harvey's Stealth Wear collection look quite ordinary, much like reflective safety clothing. Of course, most of these privacy fashions are geared toward specific types of facial recognition systems, and it's likely that we'll see designs change as facial recognition systems change and improve. And some of these styles (especially CV Dazzle) are a bit visually extreme when compared to current mainstream fashion. It will be interesting to see if facial recognition technology reaches a point where privacy from technology will truly help inform fashion.